Want to try something creative and exciting?... Maybe even a little addictive? 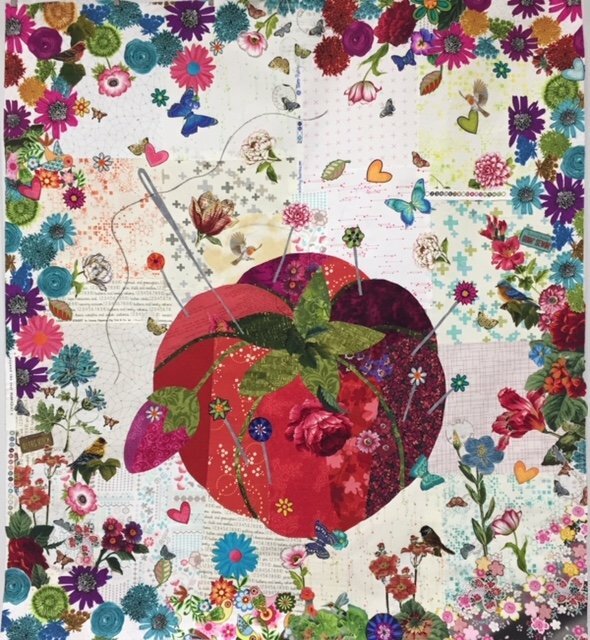 Laura Heine's patterns offer the beautiful technique of fusible collage applique. You begin with a large variety of lovely fabrics including florals, novelty prints, and anything representing your personality and interests. A bit of foundational prep, and the fun is on. Play with placing a collage of specially cut fabric images into a large-scale design pattern. When you are pleased with your creative efforts, fuse the pieces in place and quilt as you desire. Display your quilt and adore it!... And I bet you’ll want to make another… It’s that much fun! This will be a two-session class. First, we will explore fabric selections, and fabric and foundation preparation. We’ll also discover creative ways to approach the collage technique to achieve balance and interest in your design. You’ll be given some essential, yet enjoyable homework, and return for our second session ready to compose (and possibly complete) your collage. The class fee of $20 includes BOTH class sessions! Your selected pattern by Laura Heine. If you'd prefer, you may wish to wait until our first class to purchase additional fabrics as we will go over the essential qualities of the quilt design, including suggestions for your fabric selection. However, you’re encouraged to gather from your scrap stash for this project and bring any that you may wish to include in your project. * Supplies are available at The Quilter’s Trunk. Materials Included: A limited number of irons, ironing boards, cutting mats, design walls and extension cords will be available for students use during classtime. Requirements: The Laura Heine collage applique pattern of your choice. If taking the class, you may purchase your pattern at The Quilter's Trunk at a 10% discount.